On September 24th, after catching our breath from the traverse of 9,900 foot elevation Tioga Pass (see previous blog entry “Conquering Tioga Pass”) we we entered Yosemite National Park’s east entrance. We then proceeded on to our first stop; Olmsted Point overlook – named after the famous landscape architect, who laid out plans for Yosemite National Park as well as New York’s Central Park and Raleigh’s Olmsted Park. 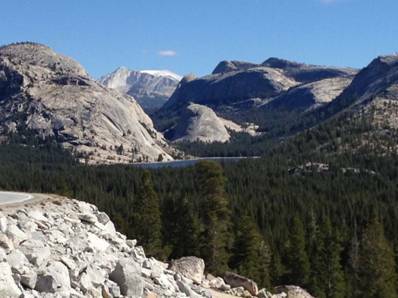 The Olmsted Point location, high on the east/west road bisecting Yosemite National Park, provides a long distance view of the impressive features to the south. Although one cannot distinctly see Yosemite Valley from this vantage point, one does get an introduction to the magnitude and variety of features contained in the Park. OK, for the uninformed such as I, Yosemite National Park covers a large expanse of territory containing many impressive stone faced mountains, lush forests, verdant meadows, lakes and streams. Not unlike other Parks you might say. 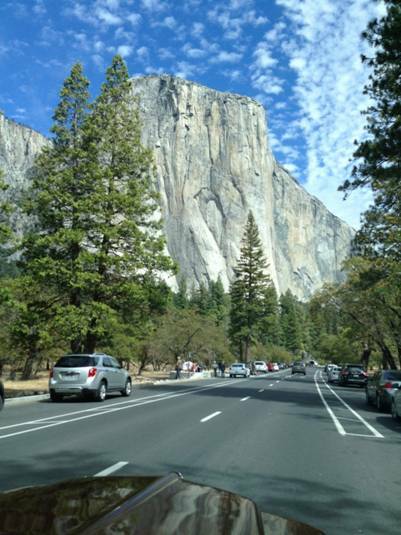 Well, what sets Yosemite National Park apart is the close juxtaposition of the features. This is particularly true in Yosemite Valley where the huge, steep faced essentially bare stone mountains are positioned on the edges of a 1 mile wide by 8 mile long flat bottomed valley containing areas of large trees, meadows, and the Merced River. Unlike the Grand Tetons, Glacier or Rocky Mountain National Parks where one might trek miles off the main road to reach the base of a stone faced mountain, in Yosemite Valley, the walls of the mountains on either side of the Valley seem to be within touching distance as one travels down the loop road. An extreme example is El Capitan which appears to jut straight up from the north side of the Valley floor within touching distance of the loop road. It is not until one spots one of its many tiny climbers on its face that one realized it is perhaps a mile away from the road. That is pretty close considering the base of the Grand Tetons, as impressive as they are, are perhaps 30 miles (I’m guessing here) away from popular viewing points. Our cabin in Yosemite Valley virtually backed up against a 1,000 foot near vertical wall of granite. After taking the afternoon of the 24th getting to know the “lay of the land”, we attended an evening Search & Rescue presentation put on by a 35 year veteran of the Search & Rescue team. He provided real-life examples of situations requiring his group’s assistance and provided tips for increasing one’s chances of survival when trekking through wilderness areas. Not that we plan any of that at the moment; however, we tried to remember some of his suggestions as we wondered about in the dark, trying to find our way back to our cabin on the unlit Valley floor – “the bears only come down to the cabins at night”. Incidentally, our cabin was “primitive rustic”, but did have a bathroom with a shower. On September 25th we elected to take a 1 hour commercial open-air tram tour to get an overview of the Valley. It was well worth the expense, as we were able to sit back and watch the scenery as our well informed Park Ranger guide pointed out the features of the Valley and took us to the Tunnel View overlook for a great (don’t want to wear out “spectacular”) view of the Valley and surrounding mountains including El Capitan, Half Dome, and Cathedral Rocks. A view eastward into Yosemite Valley from Tunnel View overlook with El Capitan on the left, Cathedral Rocks in the right foreground and Half Dome the whitish peak on the center-right. After lunch in the main dining room of the exclusive Ahwahnee Lodge (it was the least I could do for Jean after refusing to pay the $490/night fee to stay there), we left Yosemite Valley and headed south toward our evening’s lodging in Fresno, California. 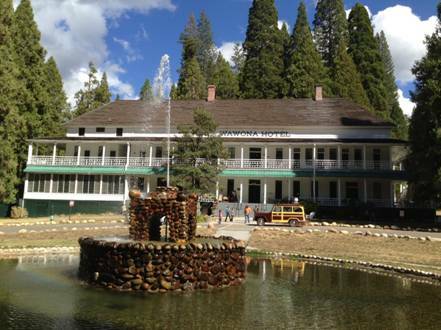 On our way out of Yosemite National Park we passed by the Wawona Hotel (circa 1915) and stopped in the Mariposa Grove where I got my first real look at the giant redwoods. Jean, being a real woman of the world had previously seen the giant redwoods – but of course, the trees were much smaller then. Thanks Mike, very appropriate. Looks like we will be shut out of the last two National Parks on our Trek; Grand Canyon and Mesa Verde. Fortunately, we have visited both of these in the past. We rafted down the Colorado River through the Grand Canyon for our 25th wedding anniversary (of course, the canyon was a lot shallower then), and recently climbed all over Mesa Verde with our daughter Jeanette and grandson Tommy. We plan to touch bases at these two parks just to complete the Trek’s goal of visiting the 12 National Parks on the 1920 Park-to-Park schedule before returning to Denver to close out the Tour’s original route. Check out Google’s tribute to Yosemite today 10-1-13?